Mem1 seamlessly blends the sounds of cello and electronics to create a limitless palette of sonic possibilities. 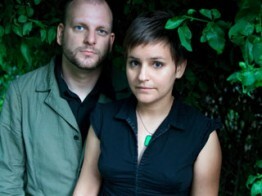 In their improvisation-based performances, Mark and Laura Cetilia’s use of custom hardware and software, in conjunction with a uniquely subtle approach to cello technique, result in the creation of a single voice rather than a duet between two individuals. Their music moves beyond melody, lyricism and traditional structural confines, revealing an organic evolution of sound that has been called “a perfect blend of harmony and cacophony” (Forced Exposure). Hailing from Los Angeles, Mem1 has traveled extensively, performing at Roulette (NYC), REDCAT / Disney Hall (LA), the Orange County Museum of Art, Electronic Church (Berlin), the Laptopia Festival (Tel-Aviv), the San Francisco Electronic Music Festival, and the Borealis Festival (Bergen). In 2007, they were awarded an artist residency at Harvestworks in New York for the creation of a new surround sound piece entitled Sonodendron. They have since taken part in residencies at STEIM and Kunstenaarslogies in the Netherlands and USF Verftet in Bergen, Norway. In 2009, they created a site-specific installation for the Museums of Bat Yam (Israel); their work has been screened and installed at venues including the Sundance Film Festival, Fringe Exhibitions (Los Angeles), and the Hordaland Kunstsenter (Bergen). Their third full-length album, +1, consisting of collaborations between Mem1 and artists such as Steve Roden, Jan Jelenik, and Frank Bretschneider, was released in Spring 2009 by Interval Recordings.